Chelsea graduated from Northeastern University with a Doctorate of Physical Therapy in 2017 after receiving her B.S. in Rehabilitation Sciences in 2016. She is originally from Cornwall, New York and first became interested in physical therapy after many years of dance training and teaching. She performed and choreographed for a dance company for 5 years while at Northeastern, and enjoys working with dancers and musicians. 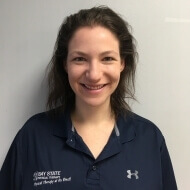 She has clinical experience with performing arts, orthopedics, post-surgical rehab, and geriatrics, and is passionate about helping her patients achieve their goals. In her free time, Chelsea enjoys dancing, painting, and running.